A rancher has created a dog food that he says contains only natural meat and poultry verified to have come for the United States. Dave Carter of Boulder, Colorado, who has been practicing sustainable ranching for 30 years, says he helped launch Pet Promise in light of recent recalls so owners would know the origin of meat in their pet's food. Carter helped Pet Promise set up a system to obtain protein from U.S. farmers and ranchers who do not use antibiotics or added growth hormones in their livestock or rendering systems. Pet Promise pet food also contains no animal byproducts or rendered meat and chicken meals. "When we talk to people who are passionate about their pets, this is a critical issue to them; knowing where ingredients come from and what's in the product," Carter states in a media release. "For us, giving that extra layer of transparency and showing consumers what's in the product makes the difference in the relationship they have with their pets." For dog parents who have a pooch who dislikes the cold or an elderly pet who chills easily, a California company may have a solution for you - a microwave heatable jacket. Warm Whiskers of Woodlands Hills, California, a maker of microwave heatable comfort pillow products for people, has created the Doggyback Jacket Pack. 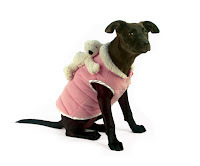 The doggy jacket/heat pack set uses a Velcro-type system to attach a warm piggybacking pooch anywhere on the jacket’s surface, enabling heat to be administered to any part of the animal - like sore joints or muscles during winter walks, the company states in a media release. The jacket, which has a layer of thermal fleece for warmth, is well suited for smaller, older and arthritic dogs. "This ... product represents a natural evolution from our success with heatable pillows designed for humans into a novel new offering for pets," Warm Whiskers co-owner Kyna Sternlight states. The jacket, which comes in black and pink, is available in four sizes for dogs ranging in weight from 2 to 44 pounds and has an adjustable belly belt. The suggested manufacturer's retail price is $35. A hands-free bag that hooks on to an animal's backside makes it easier for dog parents to clean up after their pets, the inventor says. "With a little training, any dog can easily wear the Pootrap," inventor Ron Wizgan states in a media release. The U-shaped collector, which attaches to a dog's backside by harness straps which adjust to fit a pet's body, is put on a dog just before going out for a walk. Its U-shape opening is placed at the base of the tail. The dog will eliminate in the bag, and all an owner touches is the drawstring on the bag. The Pootrap sells for around $30, depending on size. An Oklahoma-based company has created a liquid supplement that can be sprayed on food or put in water that it says improves the energy and health of sporting dogs. The Edge, an all-natural and organic formula made by Hillsboro Company of Tulsa, targets the digestive system which is essential for peak performance, endurance, hydration and appearance, the company states in a media release. The Edge also supports a dog's health by helping digestive function, the company states. It helps to elevate beneficial bacteria, preventing diarrhea from antibiotics, travel, transport stress and food change. Studies show that 70 percent of the immune defense resides within the digestive system. The formula is available in 4-ounce, 12-ounce and one-gallon bottles.